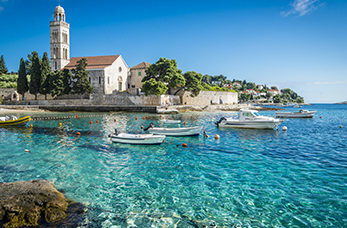 Hvar is a city in Croatia and because of its population; it's the largest settlement on the island. The town is situated on the south coast of the island near Stari Grad and Jelsa. The town contains masses of long and distinguished history as it’s the centre for culture. Hvar is the most popular tourist destination on the island and is surrounded by beautiful Gothic palaces and marble streets. Down at the main square, you can explore the winding stone streets and enjoy the nightlife. This fortress is perched on the hill above the town and was built in the 16th century. The fortress had to be restored in 1579 after an explosion in the powder chamber. There is a beautiful panoramic view of the town of Hvar and the Pakleni Islands from the fortress. This cathedral stands on the eastern side of the main square and was built in the 17th century. It can e found in the heart of the city where it can be viewed by anyone that walks by. Everyone that walks by stops to admire its beauty.